There is something rather unnerving about this teeny weeny little machine from Chillblast. It's not the matte black, brushed aluminium exterior with its heat-defying fins, and it's not the thin maw waiting expectantly for Blu-ray discs to consume. No, it's the complete lack of, well, anything when you press the on button. There is a little light above the button, but this is either not plugged into the motherboard, or is one of those Hitchhiker's Guide to the Galaxy black lights that lights up black to let you know you've pressed it. There is only the faintly audible click of the optical drive checking itself for spinnables to let you know that the Vacuum Mini is actually operational. Compared to the standard cacophonous roar that accompanies my usual PC startup routine, this makes for a wonderful change. Not even the PSU makes a sound as this li'l brick of a machine glides silently into Windows. So yeah, it's silent, hopefully that point has been hammered home by now, but the other impressive thing is the amount of power that's been squeezed into this wee PC. This is a full Ivy Bridge machine, with a H77 motherboard and quad-core Intel i5 CPU churning away inside, generally at over 3GHz. That's not where the impressive specs cease either, with a full-fat 8GB of DDR3 memory (admittedly running at the relatively lowly speed of 1,333MHz), Blu-ray/DVD RW combo drive, 240GB SATA 6Gbps solid state drive and a Freeview HD dual-tuner all crammed inside. The only slight twinge of disappointment emanating from my geek gland comes from the lack of graphical power. 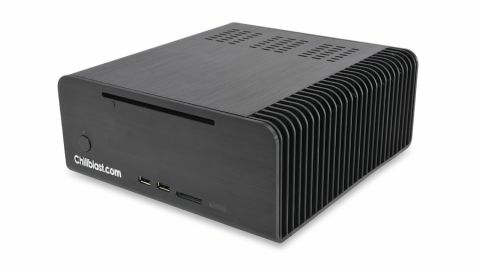 Chillblast has opted to fill the PCIe slot with the TV tuner for full media centre credentials where a low profile GPU could have been squeezed instead. Realistically though, the cramped insides and lack of airflow would do bad things to most graphics cards, so we can't fault Chillblast for that. So we have to make do with integrated processor graphics, and all the talk pre-release was about how much of an improvement Ivy Bridge graphics were over its Sandy predecessors. Sadly though, the i5 3450S CPU only comes with the weak HD 2500 graphics. That means just six execution units/graphics cores compared with the 16 of the full HD 4000 graphics parts used in a few Ivy Bridge chips. But this is no mini gaming PC. This is a bespoke Chillblast build designed to be the ultimate silent media box, so the lack of 3D prowess can be forgiven. The Fusion Vacuum Mini is still more than capable of delivering HD playback down your eye-tubes, and with a wireless N card in there it can also do it sans cabling. The big sticking point for us is the price. At £1,000 this may be every inch the luxury box for your high-end lounge media setup, but it's still an incredibly expensive media PC. If you've spent a fortune on your speaker wires and golden HDMI cabling, then you'll probably pay the premium for a totally silent PC to complement the setup. If not, the price will seem seriously excessive.